· He was born in Milk Street, Boston in 1706. · He dropped out of school, and then at the age of 12 he worked with his brother as an apprentice in a printer. · His first piece was published by his brother, called "Silence Dogood." · As he grows up he touts his self to speak a several languages. · He is one of the founding fathers of the United States, and he served on the committee to draft the declaration of independence. 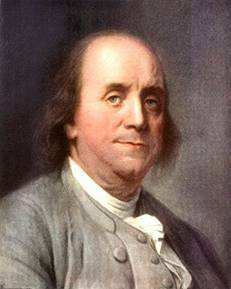 · At the age of 41 he was a politician, a scientist, writer, diplomat, and a philosopher he also founded a library, invented a stove and established the first fire department in Pennsylvania. · He did in 1790. · The article shows how much the savages are more polite and civil than them. · There are many different ways of life than the colonist. · He wanted to point out also that the Indian are a very good people and they have the wrong idea about them. · The colonist people should not always expect anything in return of their hospitality and to behave more like the decent and politeness of the Indians. · The article also talks about the religion and how if it is not yours that does not mean it is wrong. · "They beheld a beautiful young woman descend from the clouds, and seat herself on that hill, which you see yonder among the blue mountain".